Use the ideas and resources shared monthly to help youth in your zip code have opportunities to participate in well-organized, mentor-rich, non-school programs. Make this Summer a LEARNING time. 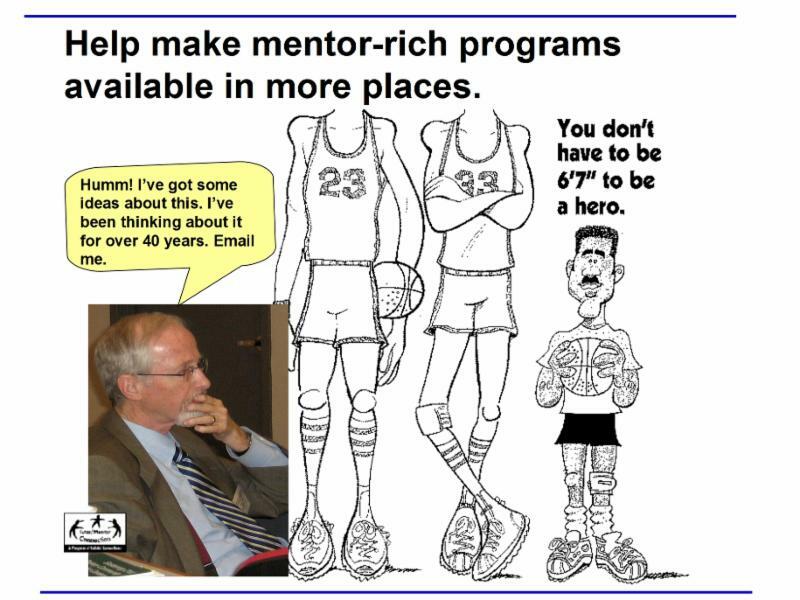 The ideas shared in this monthly newsletter can be used by youth organization leaders, resource providers, political leaders, universities, volunteers and youth to help mentor-rich programs thrive in all of the neighborhoods where they are most needed. While I try to send this only once a month, I write blog articles weekly. In the sections below I post links to a few of the articles published in the past month or earlier. I encourage you to spend a little time each week reading these articles and following the links. Use the ideas and presentations in group discussions with other people who are concerned about the same issues. If you don't save this email, you can always visit the eNews archive and read current and past newsletters. Encourage friends, family, co-workers to sign up to receive this newsletter. Click here. The problems we face are not new. The tools for connecting, learning and innovating solutions have changed dramatically over past 25 years. Use the coming summer months for learning, reflection, connecting with others. See the graphic shown above in this article. While most tutor, mentor and learning programs that work on a school year calendar are now celebrating the past year with dinners, parties and graduations, leaders in these programs should already be planning for the start of the next school year. 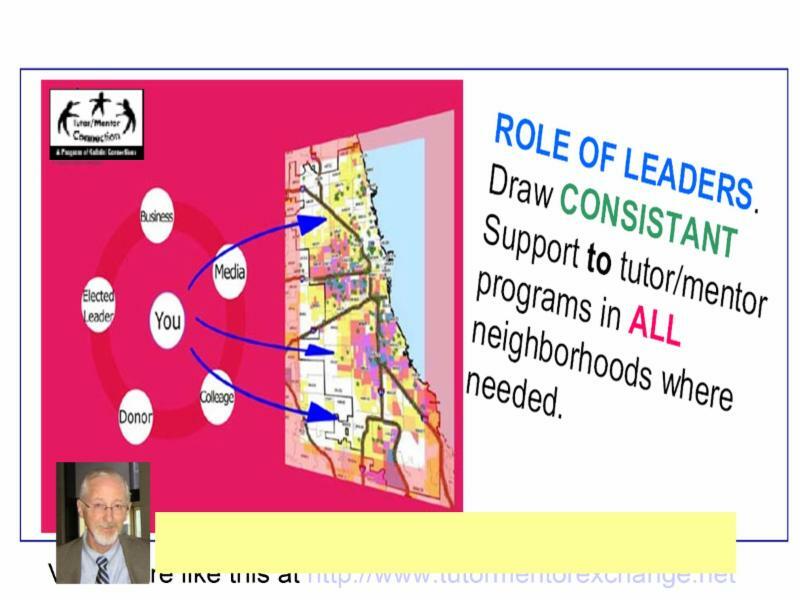 I'm already seeing student and volunteer recruitment messages from some programs, such as Tutoring Chicago. 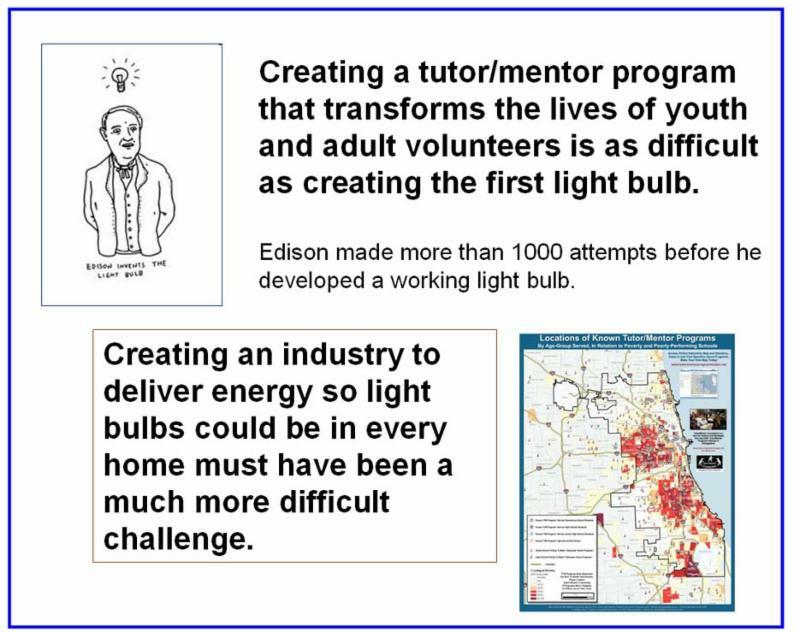 I created the graphic at the right to visualize the constant innovation that is needed to help sustain the efforts of volunteer based organizations and keep youth and volunteers involved. In this month's newsletter the following sections will focus on personal learning, by students, volunteers, staff, donors and others, that can support this journey. As you look through the links, I invite you to ask this question with me and with people in your networks. What are all the things we need to know, and do, to make mentor-rich youth support systems available in all areas where they are needed? And, what are all the things we need to know and do to keep those programs in place for many years, so they can help more kids through school and into adult lives. 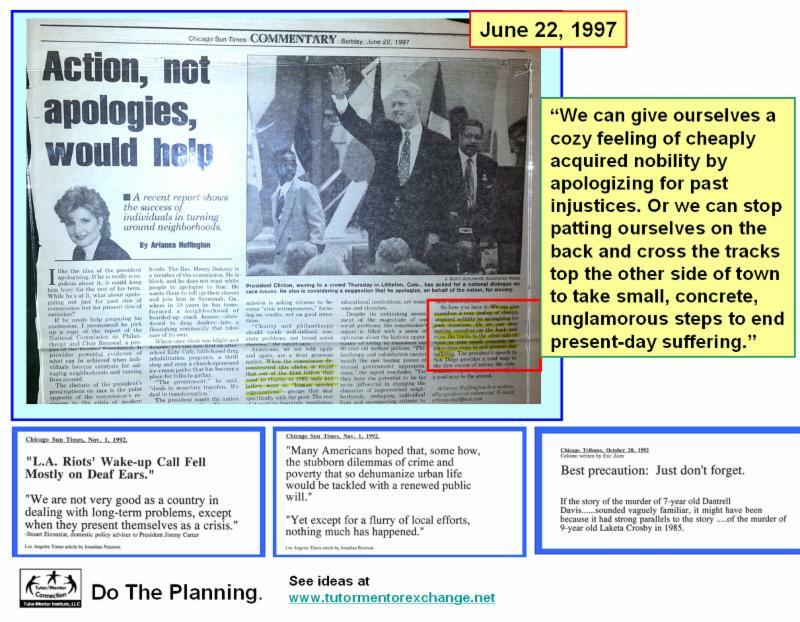 Connect with me on Twitter, Facebook and/or Linked in, and to draw from ideas I share on the Tutor/Mentor Blog, the Mapping for Justice blog, and the Tutor/Mentor Institute, LLC web site. Read the Research and Articles. Every day new articles are being published that help you build a deeper understanding of complex problems facing the world. In the graphic featured above I point to a map of Chicago showing demographic concentrations and to a cMap that shows supports kids need as the move from pre school to adult lives and jobs over a period of 20 to 30 years. This map is part of a blog article where I point to Dr. Robert D. Putnam's book, "Our Kids: The American Dream in Crisis". It's just one book you might look at over the summer. If you just look at one thing from this newsletter, view this article and video, where I show the information I point to in my blog articles, web library, etc. Return to the article often if you're looking for specific types of information. 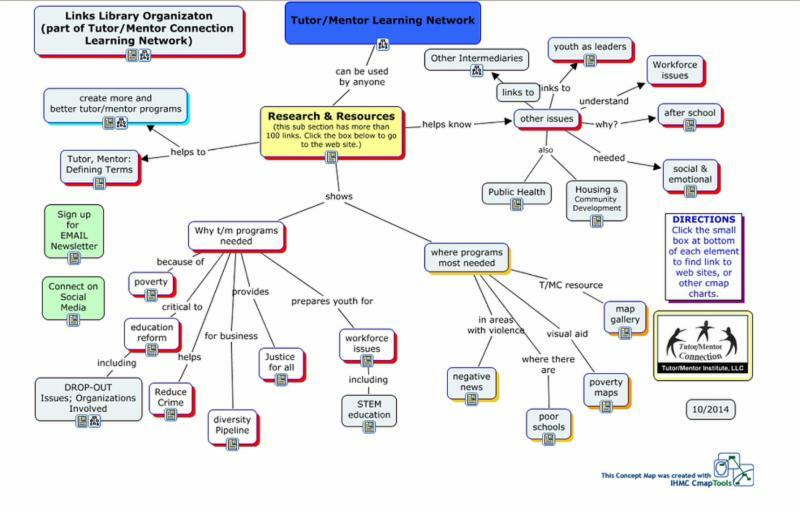 This cMap shows the research section of the Tutor/Mentor web library. While many focus on education as the reason for youth tutor/mentor programs, I point to many other reasons why well-organized, non-school tutor, mentor and learning programs are needed in high poverty areas. These are just a few of several hundred links that I point to from each section of the cMap shown above. Take time to click through and see what's available. Understand the challenges of funding programs consistently over many years, in many places. Raising kids takes 20 or more years. We need to find more creative ways to build and sustain funding for long-term organizations in more places. Find this graphic in this blog article. Since forming the Tutor/Mentor Connection in 1993 the focus has been to educate and influence resource providers so they would be more proactive in seeking out and supporting non profit youth organizations in different parts of Chicago. This is a video where I talk about how volunteers can help build stronger programs. 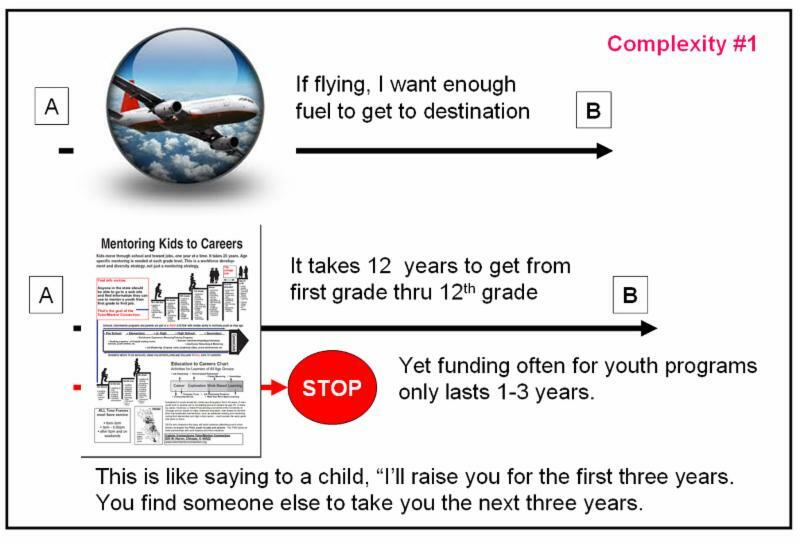 One section of the Tutor/Mentor web library focuses on Fund Raising and Philanthropy. Within that are sub categories with articles showing challenges facing non profits. Here are a few articles you'll find. Learn about resources that support youth and adult learning.  Build your own personal learning network. If youth learned to be active learners, drawing upon on-line and traditional libraries, schools would be more successful and many world problems might be reduced. 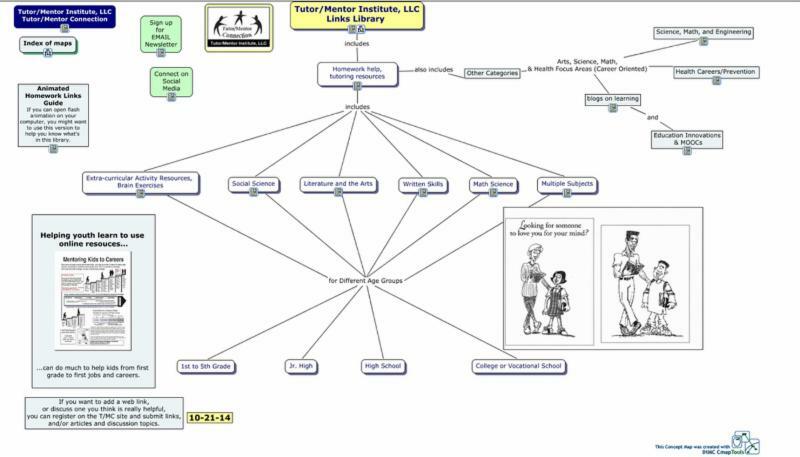 The cMap above describes the learning resources available in the Tutor/Mentor Connection web library. Take a tour of this section of the library with this video. Here's a link to the cMap for homework help. Spend some time learning what resources are in each category. Use the resources shared in this newsletter to connect and learn with others in Chicago and beyond. 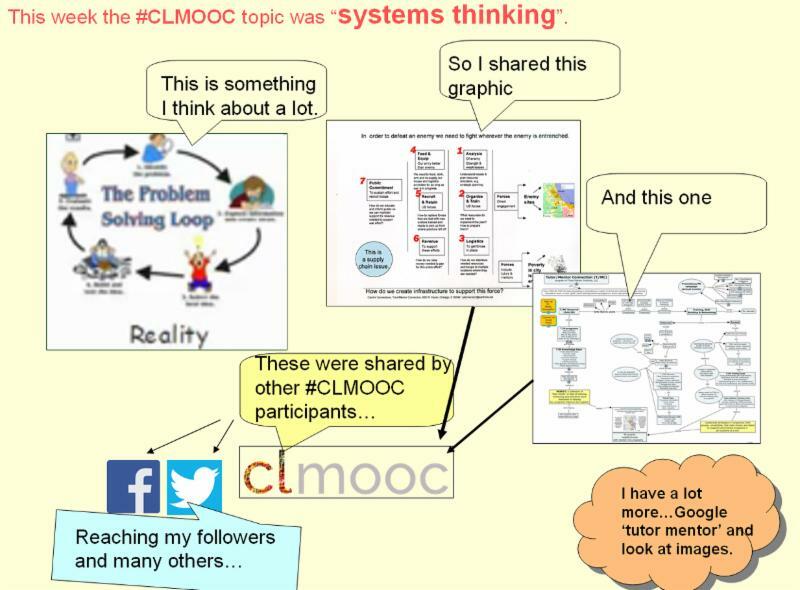 This graphic is from 2015 article showing my connection with educators via the Connected Learning, #clmooc network. I've written many articles since 2013 showing my connections with the #clmooc network because they are examples of how I hope to connect with people working with youth in non-school programs, or who are working to solve other problems that affect youth and families in high poverty areas. 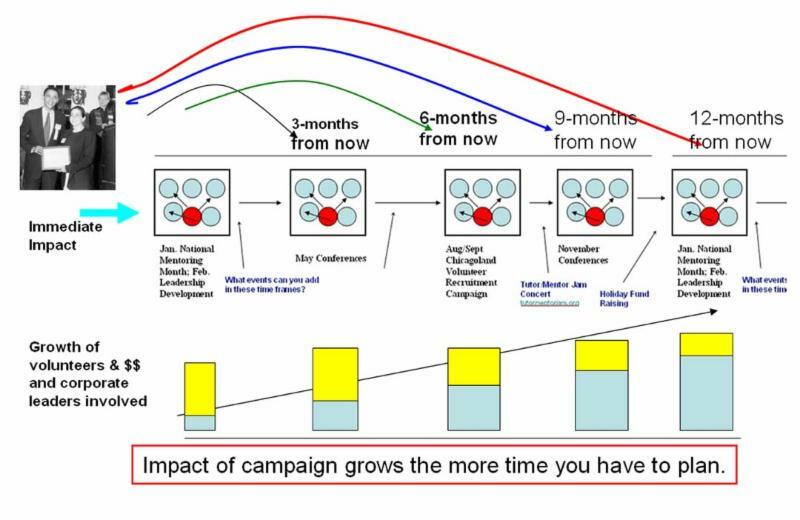 If you're doing this type of engagement create your own visualizations and blog articles to show your journey. Dan Bassill (that's me) is available to discuss any of these ideas with you, or others, via Skype, Google Hangouts or in person if you're in Chicago. Click here if you want to help me do this work.